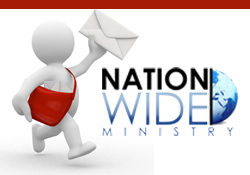 Welcome to the Nationwide Ministry Graphic Design Gallery! We currently send out 2 to 8 flyers per day and one question consistently asked is “Do you do all the flyers that we see sent?” the answer is “no” not all, we currently do about 15% of all you see. The following page highlights many of the flyers that we have produced for various churches and ministries and will give you an idea of our level of professionalism. To simplify the page we are only listing a small group of flyers, prayerfully you will be able to get a feel for our various styles of design work. We have the ability to produce anything graphically: postcard flyers, full sized flyers, banner ads, posters, logos, crests and more. Most flyers can be produced at a price of $75 be they 3 X 5 up to an 8 1/2 X 11 or specifically designed for web use. The factors that would increase the cost is graphical complexity which includes large groups of needed images for inclusion, multiple image cutouts, removing backgrounds to capture standing people for the flyer, or design direction changes once agreed to. In essence, if you are submitting 3 images you should be fine at the standard rate but if you are submitting 4 or more images the cost will be slightly higher. We can also create a logo or crest for your business or ministry, logo pricing ranges from $250 for ministries to $350 for businesses; crests which are usually requested for institutional or organization use can usually be produced at a flat rate of $350. Our designers are blessed in their craft and skill set and love doing what they do. We would love to fulfill the next graphical necessity you have for any of your up coming efforts or events. To order graphical design, please contact us at: Nathaniel@NationwideMinistry.Info or by phone direct at 773-315-5999 and allow us to put together a campaign that is sure to please you and give you the impact that your event/effort desires.